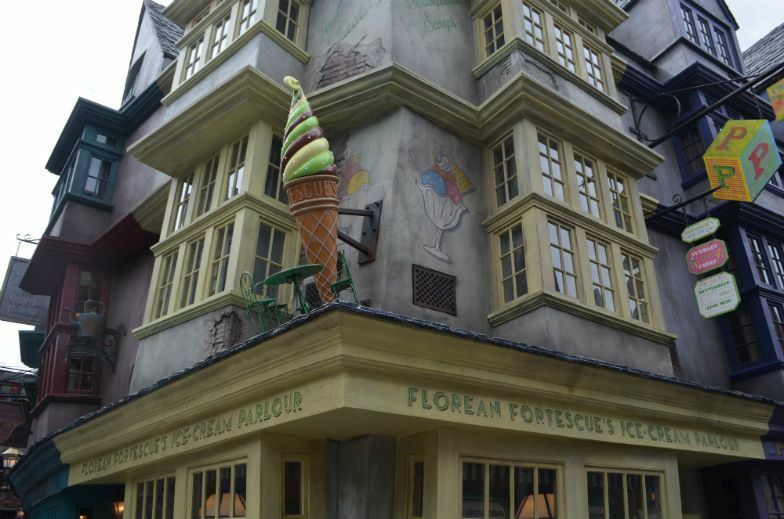 This week will be featuring Florean Fortescue's Ice Cream Parlour! This place has all sorts of different ice creams and is so much fun! Getting a taste of them all is just super amazing.The shop is located at an unknown plot number in the busy streets of Diagon Alley. It is Located next to the Second Hand Bookshop, which is also an unnumbered plot. As soon as you walk into the colourful parlor, the smell of so many different flavours hits your nose. It smells amazing. The old timey feel drags you back to a time even before Harry Potter himself. The old feel comes from its astonishing décor, being in Diagon Alley, and just having the old look to it. It tells of its history, which is as rich as all the parlour's ice creams! So this place has been around since who knows when. It is presumed that Florean Fortescue opened it himself when he was a young wizard just out of Hogwarts, which is very believable. He brought it to its amazing glory and it has continued to be glorious. Back in the day's of Harry Potter, the owner would give the boy ice cream every half hour in 1993 when Harry was studying his books for that next year. When Harry was going shopping for his first year, Hagrid brought Harry a large cone, chocolate and raspberry flavoured with chopped nuts. A few years after 1993, in 1996, Florean Fortescue was dragged away by death eaters and ultimately killed by Moldy Voldy himself for either knowing too much or too little. Flroean Fortescue's Ice Cream Parlour was certainly a historical treat. Now on to the even better part of the trip: tasting every single colourful bit of icy, creamy goodness that lay in display for all to try and see. First was a cotton candy flavoured, pink creation that came with a bit of a strange warning. It definitely tasted like pure, but creamy sugar. But if one had too much of it, it would have tasted like warm milk! (Not that many people would be complaining. Warm milk? GREAT sleep aid!) Next I went to the Bertie Bott's ice cream. Three tastes of this yielded three different flavours! Moving on to a weird, grey coloured one that tasted like tea, but it depends on the person eating it. Once some of it melted on the spoon, it tasted like tomato juice without a little extra sugar. Don't let that melt. Then it was on to a chili pepper coated ice cream. Great if you like hot, creamy things. It mostly tasted of a muggle hot sauce that a lot of people use, tabasco sauce, mixed with a creamy delight. This place offers a lot of different sorts of flavours (even bacon flavours!) for all journey there that you would not find anywhere else. As a conclusion, this is an amazing place to visit! Highly recommended. Just don't eat the yellow, summery one unless it's summer! Lastly don't just take this word for it! The opinions of these lovely Diagon Alley goers love it too! These are how they answered after being asked their opinion on the shop. Pheonix Blaze: "I think its great. There are so many options. I get icecream there at any chance. I even order it, and have it delivered directly to the House Elves, and they only bring it out if I ask for it." Rose Knight: "I like it, who doesn't love ice cream." Luna Raven: "Well I like how there are a lot of cool flavors and find it funny that some will get a bad taste after a certain time." Marilla Valerian: "I like it! I like the different flavors. But sometimes I wish they had a few more... Simple/muggle flavors. A little taste of home for some of us." Laylah Penhallow (Gryffindor Head of House): "It's ice cream! so it's great!" Ailey Saunders (Muggle Studies Professor): "It's delicious because it has ice cream :3"
And there you have it folks. You should visit the greatest Ice Cream Parlour on Diagon Alley! So, that's one adventure down and plenty more to go! Where do you think I should go next? Lithieni Abbott This was awesome! Fiona Goode I loved this so much! I love ice cream and Florean is my favourite place to go for it when I'm craving it and that's a lot. Islanzadi Targaryen Reading this article made me want to go an ice cream! Cindy Skysong Good job! It certainly has an original style to it. Rose Knight Wonderful article Temp! Aspen Elysium great article Temp! Genevieve Schubert Ahh! Tempe! This is an amazing article. Ailey Saunders YAY Temperance <3 this is wonderful, lovey dovey.